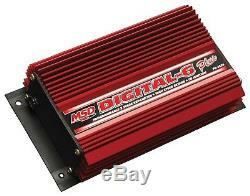 MSD Ignition 6520 Digital-6 Plus Ignition Controller. 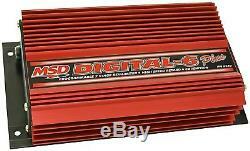 Digital-6 Plus Ignition Controller; For 4/6 Even Fire/8 cyl. 7 Amp per 1000 RPM. Spark Duration: 20 Degree Crankshaft Rotation. Voltage: 12-18 V; Negative Ground. WARNING CA Proposition 65: Yes. Switch between 2 rev limits. Single stage retard for nitrous and top end performance. Start retard eases pressure on the starter; flywheel and engine. LED warns of trigger signal problems or faulty charging system. The MSD digital-6 plus ignition control combines terrific power, digital accuracy and great accessories making it ideal for street and strip applications. Every spark of the digital-6 plus ignition is packed with 135 millijoules of spark energy and 535 primary volts. When used with the MSD blaster HVC Coil (PN 8252) a spark with over 300 milliamps burns across the plug gap for 400 microseconds. Below 3,300 rpm the digital-6 plus produces a series of sparks that burns in the cylinder for up to 20 degrees of crankshaft rotation. This incredible heat ensures combustion to produce great power, quick throttle response, smooth idle and quick starts. The team at MSD is no different as we strive to deliver the products you need to meet your performance goals. We continue to innovate and invent components and technology that deliver performance and reliability with products that are easy to use and install. Over the course of 40-plus years, MSD Performance has been driving the development of innovative components that helped shape the way our cars race and perform. From super speedways to road courses, land speed racing to top fuel dragsters, and of course your traditional hot rod, MSD has provided the components to fire nearly anything in motorsports. Early on, MSD focused squarely on ignition systems with revolutionary products like the multiple sparking CD ignition, timing and rev controls, billet aluminum distributors and the Pro-Mag, an incredible breakthrough in power and endurance. Today MSD is developing electronics for your entire powertrain. The Atomic EFI systems for the LS engine platform and throttle body are now complemented with a transmission controller. Our DynaForce Starters and Alternators ensure that your engine cranks over to fire up and the Alternators keep it charged. MSD is poised to deliver components that work and communicate together to provide performance and value. Starting from a small garage in the 50's to the beautiful new 6000sq ft showroom we have today, customer service has always been a top priority. We can only process Domestic credit cards. Which carrier is used depends on your location. We will choose the carrier that will deliver the quickest for your location. We can not and will not declare an item as a gift. We strive for accuracy, however, there could be discrepancies on the manufacturers end with listing applications. PLEASE MESSAGE US WITH ANY QUESTIONS OR CONCERNS ABOUT YEAR/MAKE/MODEL INFO IF YOU NEED! That said, we will assist in processing a claim. In either case, we will assist in the process. This listing is currently undergoing maintenance, we apologise for any inconvenience caused. The item "MSD Ignition 6520 Digital 6-Plus Ignition Box 2 Step/Start Retard/Stage Retard" is in sale since Saturday, November 22, 2014. This item is in the category "eBay Motors\Parts & Accessories\Car & Truck Parts\Ignition Systems\Electronic Ignition". 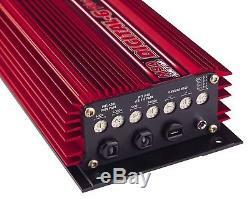 The seller is "espeedshop" and is located in Lindenhurst, New York. This item can be shipped worldwide.